John P. Wilson's skills as an archeologist served him well during a 25-year odyssey to uncover fragments of journals and letters written by Lewis Roe, a veteran of the antebellum army in the desert southwest and part of the 50th Illinois Volunteer Infantry as it marched with Sherman through Georgia and the Carolinas. The search for Lewis Roe actually began when Wilson was a child in Knoxville, Ill. The town librarian was Roe's daughter. She showed him some letters written by her father while in the field with the Army of the Tennessee. Wilson was hooked and, over the years, he gathered other fragments of Roe's writings and discovered more details of his life. 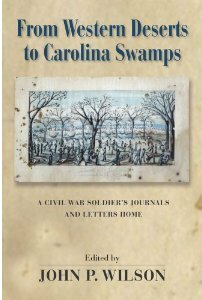 Roe's regiment marched through Columbia, SC on Feb. 17, 1865. In his journal, Roe described it as “a nice, pretty place.” But he also confirmed that “The town is on fire & I am afraid it will all burn down. The boys can hardly be controlled.” Wilson discovered that Roe often did what many veterans did; projected themselves into events “giving the reader or listener the impression that the narrator took part in the event” when they were only repeating what they had been told. By organizing Roe's writings and adding his own thoroughly researched commentary, Wilson brings to light an infantry man's perspective, producing a valuable document and a lively read.